PLEASE HELP!!! First hatch! No zip!! Is he going to be ok???? Discussion in 'Incubating & Hatching Eggs' started by TildaTrotter, Aug 8, 2009. I set 6 eggs 20 days ago in our tiny little bator and last night on day 19 3 started pipping. There were 2 different types in there which came from my own flock (my silkie wont go broody so I can't leave them with her). I put in 3 silkie X pekin bantam and 3 wyandotte bantam X pekin bantam. 1 was not fertile so I removed that from the bator at day 13. But the 2 of the same have hatched now and as my incubator is tiny had to swept straight into the brooder. However the other type egg pipped at 9 last nite and still hasn't zipped!! I did have to open the bator to get the two lil babies out but i did it real quick and monitored everything. The egg is jiggling and rocking as the chick inside moves and its peeping but its sounding tireder as its now just gone 6.30 am here. Is the little one going to be ok??? No sign of pipping from either of the other eggs yet either. Please help it's my first ever chicken hatch. There are threads here about helping... most of the time its not a good idea but I helped two live that wouldn't have otherwise in one each in my last two hatches. Tilda, there are some posts on here that can help you with assisting a chick to hatch. Seems that most though, prefer to leave them alone and NOT open the bator no matter what to keep the humidity constant. Whatever you decide, good luck with it. It often takes 24 hours from pip to zip, and the chick sleeps quite a bit during the process. He might pop out tonight while you sleep. If not, sometimes he was weak and not meant to be. 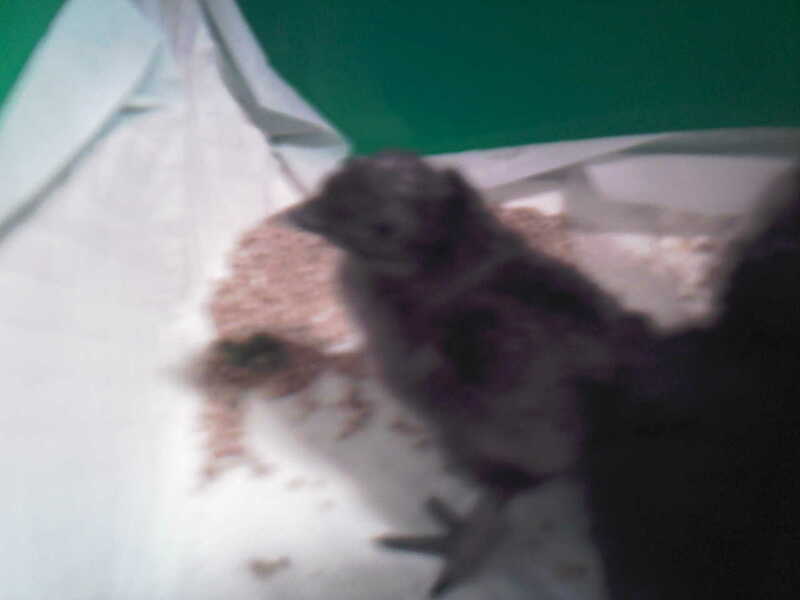 Well he or she will be hatching during the day now and humidity is at 70-75% Because the first chicks were removed as quickly as possible it didnt spike or even change same as the temperature. Yeah the two are beautiful they are black with white chins n bums! I'll post pics asap but I'm just worried about this little one I think I'll read up on the helping and make a decision that way. The shells of the eggs that are left are quite thick. I just really don't want it to die. Can I ask what made you make the decision that you did and do you fell it was the right one?? Well I decided to help him (or her) and hes very weak and just laid in the bottom of the bator. We gently peeled his shell off and then he managed to find his way out. However he was bleeding from his vent or vent area and had a large swelling It may be that it stands out because hes not dry yet but I'm thinking he may be deformed? I couldn't just leave him there though it had been almost 12 hours with no sign of zip. Maybe that was th wrong decision but I am very sure he would have died anyway. At least I gave him a shot. Sounds like he didn't absorb all the yolk sack which is the problem with helping a chick too early. Well he was definately on the way out he would have died. He or she is the one on the left as you can see although the picture isn't very clear he is getting stronger and is keeping up with the other 2 hatch mates. I really did think he was going to be a goner however I literally could not sit there and watch him die. We once had a puppy who heamorraged from his umbilical cord because his mum nipped it too close he almost died as well but thanks to the help of superglue he survived, there was no way I was not giving this chick a chance. Even if he or she has to live with me for the rest of it's life at least I know it will have a good life. Even if he does still die at least he's had a chance. Im doing the same thing...been popping buffs like popcorn...then all of a sudden it stopped....had two that had zipped and were with legs out...for 35hrs, drying out bad...so I kept them moist with warm water...q tip gently pushing back membrance...first one real weak, took 3hrs to just stand up, looks bald...the other one still laying down...only been lke 1 1/2hrs...Im waiting...the other eggs all stopped!!!! I was due yesterday and my hatching started aug 5th. Thank you. Actually tx2medic (sorry if I spelt that wrong) I've been watching yours and henmasters hatches while I was waiting and I think you did the right thing and yes gammy(thats his nickname) was very weak for about 24 hrs afterwards I was convinced he was going to die all of yesterday, I kept ringing my mum getting her to check and feed him while I was at work but he fed himself last night and he survived the night so I think he will live. You used a q tip for the membrane I did consider that however we used a soft make up brush after it had been sterilised. So long as your gentle removing the membrane and don't push the chick I don't see too much of a problem! I just watched the video you posted about the sexing by the wing feathers so I'm now going to find out if Gammy is a girl or boy!!! I'm hoping girl but have a feeling he's a boy. I'll post when I know. What was your hatch rate in the end? So far we've had 60% however we still have two eggs that may hatch but we don't think they will.